Supplement your lifestyle needs with guaranteed lifetime monthly income. Whether you are planning for your life goals, securing your child's future, building a comfortable retirement income, or leaving a lasting legacy, get the assurance and flexibility to enjoy life's moments with GREATLife Generation – a whole life insurance plan which provides you with guaranteed monthly income for life. This is not a fixed or savings deposit, but a whole life insurance plan. How can GREATLife Generation benefit you? Supplement your lifestyle needs with guaranteed lifetime monthly income from the 5th policy year. Your guaranteed monthly income increases by 6 times from the 10th policy year. Receive extra cash on top of your guaranteed monthly income in the form of non-guaranteed cash bonuses. Free up your finances to fulfil other needs. No medical underwriting is required when you apply for GREATLife Generation. Enjoy whole life insurance coverage against death and terminal illness. You can choose to buy this plan to provide cover on your child's life, and enjoy the flexibility to transfer the policy ownership for your child to receive the monthly income. When your child passes on, his or her loved ones can receive the death benefit. Mr Tan is 35 years old (age next birthday). He signs up for GREATLife Generation and pays a yearly premium of S$10,000 for 10 years. 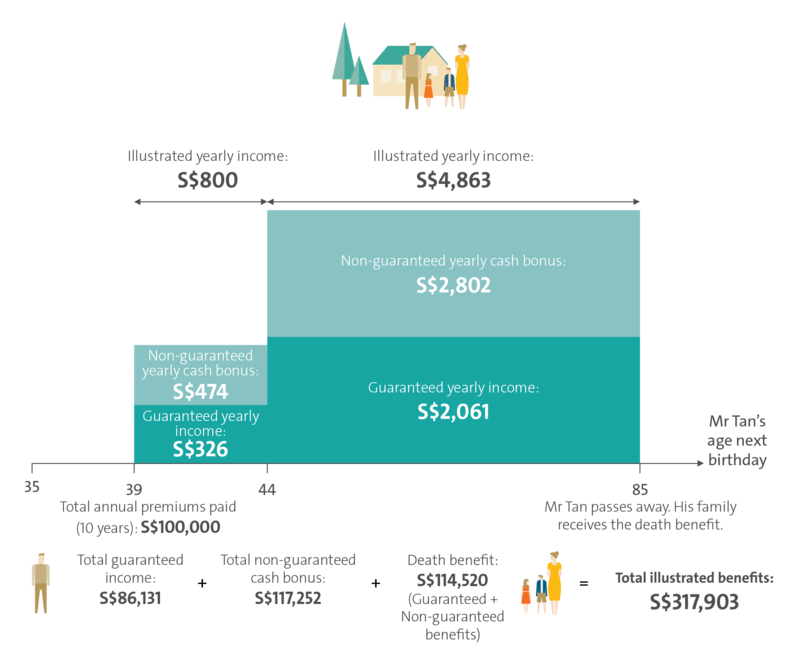 The illustrated yearly income is based on monthly income x 12. The figures used are for illustrative purposes only and are rounded to the nearest dollar. Please refer to the policy illustration for the exact values. The illustrated figures consist of guaranteed benefits and non-guaranteed bonuses. The non-guaranteed bonuses are based on an illustrated investment rate of return of the participating fund at 4.75% p.a. 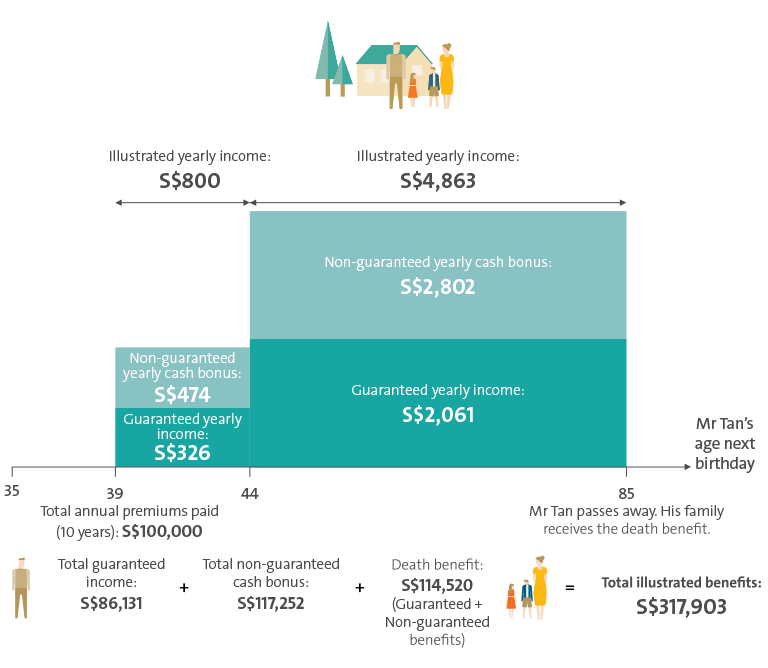 Based on an illustrated investment rate of return at 3.25% p.a., the illustrated yearly income from ages 39 and 44 are S$554 and S$3,406 respectively, the death benefit at age 85 is S$109,760, and the total illustrated benefits will be S$252,176. The actual benefits payable will vary accordingly to the future performance of the participating fund. GREATLife Generation is provided by The Great Eastern Life Assurance Company Limited, a wholly owned subsidiary of Great Eastern Holdings Limited and a member of the OCBC Group. This plan is not a bank deposit and OCBC Bank does not guarantee or have any obligations in connection with it.